Compare to GUM or Dentek braces wax! Traditional unscented, unflavored clear dental wax for braces helps to protect your lips and gums and makes you more comfortable in those difficult first months of orthodontic treatment. A little bit of dental wax provides hours of pain relief from irritation by orthodontic brackets and wired. High quality - compare to the leading brand! The containers come in assorted "tropical" colors. Want to save even more money on dental wax? 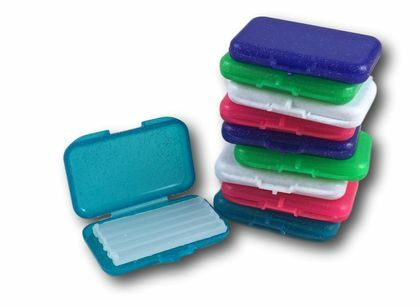 Click here to order a bulk box of 50 containers of clear dental wax for $29.99! Each package contains 10 containers of dental wax. They have the best price for this product. I have lingual braces--the kind that goes behind the teeth. Gee, they sure are far more scratchy and jabby than anyone let on. Well, if you (and your tongue) are suffering through these, too, then get this wax by Dentakit. The garbage wax they sell in the drugstores or they give you in the ortho's office doesn't even compare. First of all, this stuff sticks to your braces a lot longer, which means you will have a lot less problems while eating. (But, it's also easy to remove.) Then there's the taste. What sinister person decided that ALL wax sold in drugstores needs to be mint-flavored? Seriously--the mint they add flavors every single thing you eat with mint. Things you definitely *don't* want to taste like mint. I can't tell you how many meals horrible mint-flavored wax has ruined. Too many. Well, the wax sold by Dentakit is flavor-free. You don't taste anything. No mint, no chemicals, no nothing. I. Love. This. Stuff. I honestly can't recommend it more. I love this product! So much better than major brands or drugstore brands. Very pliable and stays where I put it. Price is better than stores also. Excellent price. Adheres easily. No funky taste. I couldn't go without it as my teeth move. I will be back for more. Fast shipping. I bought this because it was a quick fix for a broken wisdom tooth. It helped so much. My daughter recently got braces, and this wax was a god send, as she ran out of orthodontic wax in her first week!! Thanks so much for a great product! ProsWax worked great! And speedy shipping! This wax is much more pliable than the sample I received from my orthodontist and applies very easily. Excellent Customer Service too. This wax is so easy to apply, especially if you put it under hot water to make it more pliable. It lasts all day. This is the best wax I have ever had. I've ordered numerous types, including silicone, and nothing is more pliable and durable than this. Definitely will be ordering more! My daughter had an accident and chipped her two front teeth. Because of big wound in her lip the dentist will see her 3 weeks later. We ordered this dental wax to cover the sharp edges of the broken teeth. It was the best solution. This product is clean, without unpleasant taste, easy to use... Fantastic product, and I would definitely recommend to anyone, many thanks!